The initial mass function of stars – from a weirdo to perfect order? Stars are formed via collapse of the interstellar gas into dense cores. The initial mass function of stars (IMF), which means the mass distribution of stars that form in a cluster environment (like this), seems to be pretty universal. However, if we go back in time, or redshift in a cosmological way of thinking, things aren’t that clear anymore. Populations of stars which were formed very early after the Big Bang contain far less metals (elements heavier than helium) than in our direct neighbourhood. This is because metals are formed in stars themselves and therefore the earliest ones had to get on without them. Unfortunately, as often in astrophysics, the stellar population naming system is a bit confusing: the earliest stars and therefore the ones with the least metal content we know about (in fact, their existence still needs to be proven observationally) are called Population III stars. The idea behind this generation scheme is that firstly huge Pop III stars are formed after the Big Bang, explode as supernova and provide the grounds for the formation of the first Pop II stars. These are then the second generation, already containing a bit of metals, but very few in comparison with nowadays Pop I stars like the Sun. However, the details of the transformation from Pop III to Pop II are undergoing a lot of debate, challenged by observations of extremely metal-poor Pop II stars, whose metals must have been injected from a single Pop III supernova. To get an idea of how this could work out, the authors of today’s paper run cosmological simulations with the Enzo code, trying to understand the transition from Pop III to Pop II star formation. To do so, they insert Pop III star particles in a complete metal-free gas environment, like the conditions in the early Universe. As shown in Figure 1, these stars live and radiate away their photons, then explode in huge supernovae and finally enrich their surroundings in metals. The blast-wave of the supernovae triggers turbulence (chaotic movement in the gas particles) in the neighbouring gas structures and induce collapse. 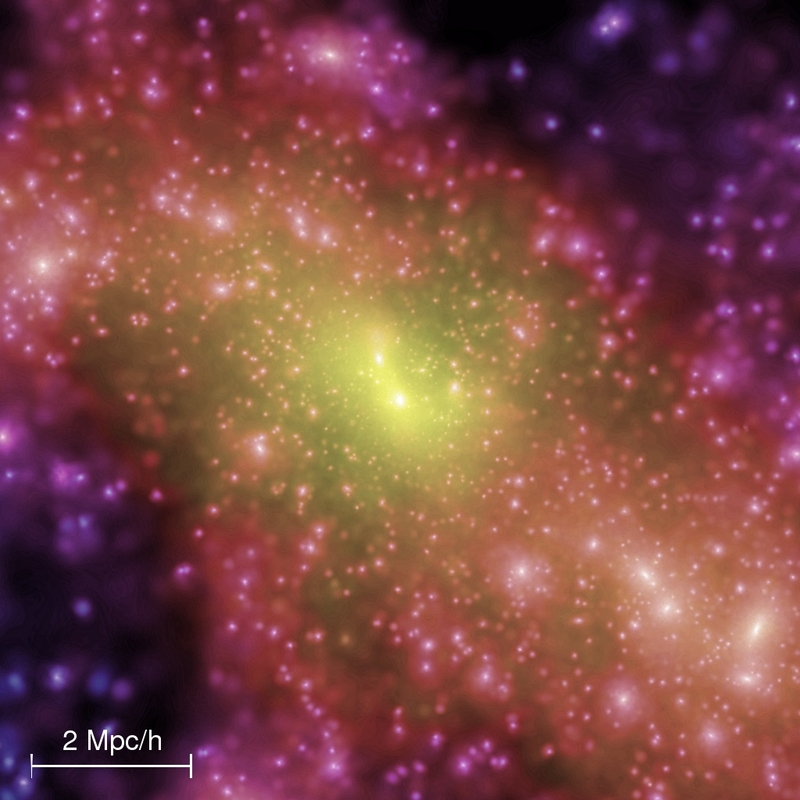 As the gas collapses toward the center of the gravitational structure it fragments into several pieces of “low” mass, in accordance with the observation of the oldest known stars to date. As known from cosmology, the build-up of the cosmic web is dominated by dark matter and dark energy. Therefore, the behavior of the baryonic matter, which is the essence of all visible objects in the Universe, follows the clumping and motion of the dark matter around it. The gas falls in so called dark matter halos, which gravitationally dominate all gas, stars, planets, and so on, in their direct surrounding. 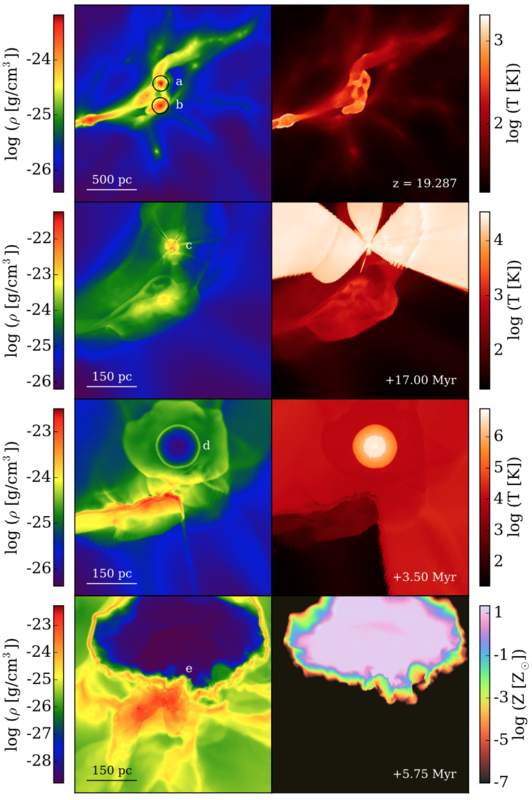 Figure 2: The top panels show the cumulative density (left) and metallicity (right) in the line of sight for two Pop III stars which exploded in the simulation. The colored circles correspond to the place of enriched halos, the color gives their metallicity. The bottom panels shows the logarithmic density in zooms onto these regions. The right supernova has a lot more neighbouring dark matter halos and thus enriches much more material. Source: Britton Smith, Webpage. The enormous blast-waves, ejected by Pop III supernovae, hit these halos and influence the gas inside them. Thus, to get an idea of much matter is influenced in their simulation, the authors check which halos are in the contaminated area around the exploding Pop III stars. 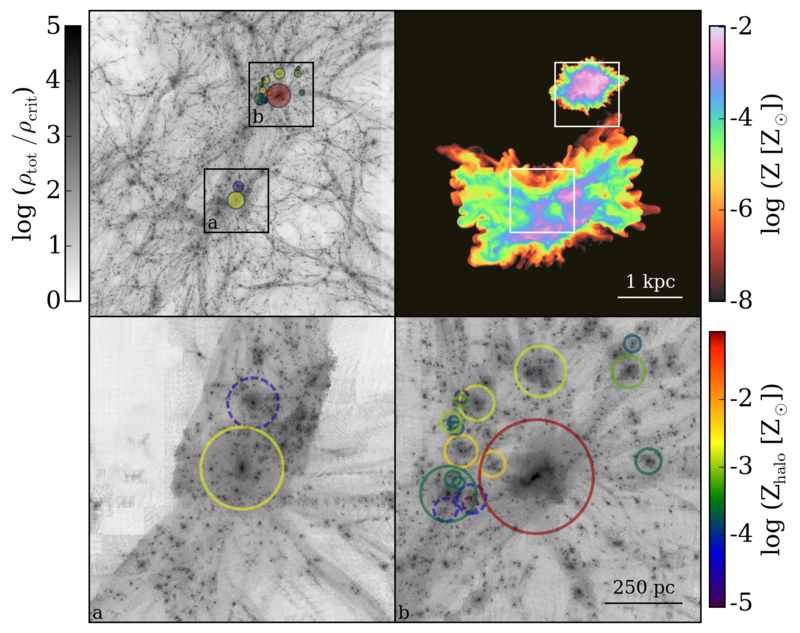 The two supernovae and the affected dark matter halos are shown in Figure 2. Most interestingly, these affected halos end up with extremely different metallicities, from 0.0001 – 0.01 the solar metallicity. Even if this channel, the enrichment of gas via only a single supernova, is probably not the dominant process by which Pop II stars are formed, it is very interesting to see such huge diversity in the outcome and might give rise to a transition of the early IMF to the very uniform IMF we observe today. If you want to see the simulation in action, please check the video below. For a description of the video, please visit the website of the main author.